There are a number of uses for a fence, from establishing a visual barrier to simply marking the separation line between two areas. Many forms of fencing are costly, even if you are building the fence yourself. But there are a few styles of fence that can get the job done without breaking your budget. 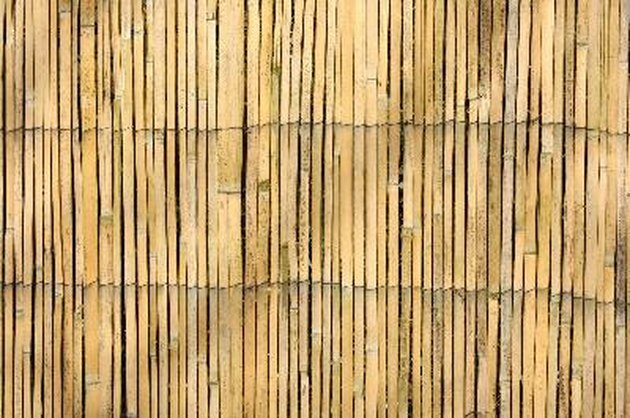 A bamboo fence can give you privacy without breaking the bank. Poultry netting, also known as chicken wire, is probably the most economical fencing solution out there. The fence is simply a short roll of thin wire mesh that you have to attach to a series of small posts. Poultry netting is generally only a few feet high, so it is not a good material for a large fence, but an excellent and cheap way to fence in small animals. Chain link material is a little more expensive than chicken wire, but for a full-sized fence it is one of the most economical options. The fabric is made from woven pieces of wire and then stretched out across a series of posts. Chain link fences are see-through, but they provide a solid barrier between spaces. As wood fences go, a post-and-rail fence is about as simple as they come. Large posts are installed a few feet into the ground and then long wooden rails are hung between the posts. These fences have an attractive, rustic look and are often used to fence in large pastures. Select the wood carefully if cost is an consideration, as some require more maintenance and staining to keep looking good. Large privacy fences are not often inexpensive, but there are a few economical options. Rolls of bamboo twigs provide a fairly solid barrier without costing too much money. The rolls are attached to tall, thin metal posts that are installed in the ground. The individual pieces of bamboo are attached to each other with wire, keeping the structure of the fence intact. A stone wall in only a cheap option if your property has large stones already on it. To install the fence, just dig a shallow trench and then start stacking the rocks. If the wall is constructed slowly and with care, there is no adhesive or mortar needed, just the rocks. Stone walls can be several feet high and can even act as a retaining wall. As far as materials go, a jackleg fence is just like a post-and-rail fence, but with a different look. Two posts are joined together to create a long-legged "X" shape. These "X" forms are placed between 8 and 16 feet apart and wood rails are installed between them, creating the fence. A jackleg fence looks perfect on a range or in a forest, and the installation is fairly simple as the posts aren't installed into the ground. A bramble fence has twigs as posts, with each about 1 to 2 feet high, separated by about 1 foot. Then long branches are woven between the twig posts, creating the fence. Any property that has a good number of trees can have a bramble fence at almost no expense. The only drawback is that these fences aren't strong and probably shouldn't be built more than a few feet high.